Jason Frost, who lives in Hueytown, and his friend Brandon Key were out on the Warrior River near Bluff Creek Saturday morning when they heard a splash and saw something swimming across the water toward them. They weren't sure exactly what it was until they heard the meows. The kitten, an orange tabby that looked to be about a few months old, swims right up to their boat and Frost picks it up by the nape of the neck and sets it aboard. The kitten shakes off and starts meowing. "Never in my life have I seen anything like that," Frost says in the video. They see another kitten jump into the river and start swimming toward them, so they move the boat closer using the trolling motor and Frost quickly snatches it up into the boat. The two kittens are identical.Frost said he isn't sure where the kittens came from, but he doesn't think they just got loose. There aren't any homes near where they were fishing, he said. He thinks someone might have just dumped them there. After bringing the kittens back to shore, the fishermen met a young family who offered to give them a home — providing a happy ending to what is easily one of the most unfathomable fishing stories ever told. 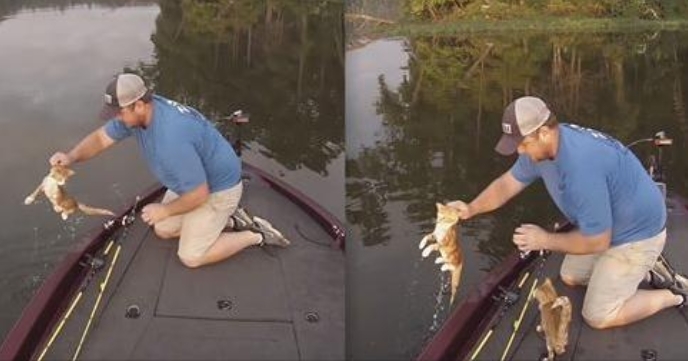 I really don't know how to describe this video, but the Warrior River never fails to surprise me......this puts a new spin on the term "catfishing"
Responses to " Alabama Fishermen Rescue Kittens From Warrior River"
Thank you for being so kind hearted..not to many people would have help these little kittens..God bless you and your kind souls both of you did a great thing..
OMG no telling how long they was there, to swim over to a boat ,they must have heard your guys voices ,BLESS YOUR KIND SOUL I am so glad you have a kind heart God Bless you both !!! Nice of these guys to get the cats - but seriously, do you think they could have moved the boat over to where the kittens were instead of making them swim. These poor little kittens probably haven't eaten for days. I hope they took these babies to a rescue. It would have been nice to see them dry off these little ones. But at least these guys were there for them. Wow, who would of thought something like that would happen? Not in a million years. You 2 guys are true angels for saving them. Thank you both. May God bless & be with you both. God bless you for saving the kitties!